Most of the Android phone users still running Android Lollipop on his phone. If you want more features and control than Android Lollipop then you have to use Android marshmallow on your phone. Most of the users face difficulty to manage his apps on new operating system. 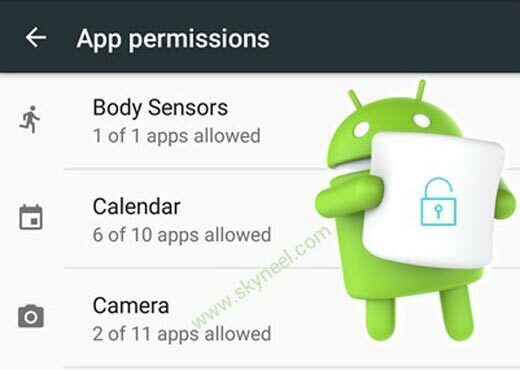 Now, there is no need to worry this guide helps you to easily manage Android 6 Marshmallow app permissions. Most of the Android phone users don’t want to upgrade his phone due to hesitation how to work on new operating system. Apps permission is an important part in each Android phone. Android marshmallow allows you to provide much better control over what permission do you need for running the app on your device. During downloading or running the app you have to grant or deny the access to use particular feature on your device. When you download any app from the Google Play Store and ready to install you will get a notification which ask about the permission need to access the app. After tapping on the Accept button app installation process will be started. Any time you can easily manage app permissions on your Android marshmallow. You just have to take few simple steps to know how to manage Android 6 Marshmallow app permissions or upper version. Step 2: Scroll down the page and tap on the “Apps” option. Now tap on any required app which permission you want to set or modify. Step 3: Tap on the “Permissions” in App info window now, you will get a list of the permission which you want to turn on or off as per your need. Now you can check that app permission is properly working on your Android phone. You can also manage app permission for any particular group. If you want to manage app permission for any group then you have to take few simple steps. Step 1: Tap on the “Settings > Apps” option on your Android phone. Now tap on the Gear icon which is located on the top right corner of your phone. Step 2: Tap on the “App permissions” option to configure the apps as per your need. Tap on any group which permission you want to set or modify. Now, turn on or off required permissions as per your need. I hope this guide is useful for all those novice users who want to manage Android 6 Marshmallow app permissions or upper version. If you have any suggestion regarding this article please write us in the comment box. Thanks to all.